Laolao Bay Watershed is unique part of CNMI’s ecology, economy and culture. Located on the east side of Saipan, the bay hosts diverse coral that is sheltered year-round from wind and waves. As a result, it is one of the most utilized sites on Saipan for fishing, snorkeling, diving, and other forms of recreation and tourism. Each month, at least 4,000 people visit the bay (MVA), and the coral has been valued at over 10 million dollars per square kilometer. Considering the impressive economic, ecological, and cultural value of Laolao Bay, protecting the ecosystem from ridge to reef is a priority of the Coral Reef Initiative. In addition to the social and economic importance of the bay, Laolao also has strong historical and cultural importance. The watershed is not only the earliest site of civilization in the Northern Mariana Islands. Excavations at Laolao recently uncovered evidence of the oldest known habitation in the entire Remote Oceania, radiocarbon dated at 1687-1531 BC (Carson and Hung, 2017). People have been living in the Laolao watershed for over 3,500 years! Archeological studies throughout the watershed have found several large village sites with petroglyphs and rock art, stone and shell artifacts, ceramic shards, and latte stones. As a priority watershed, Laolao Bay has been the focus of extensive efforts to protect and preserve natural resources. A Conservation Action Plan (CAP) was completed in 2009 and updated in 2012. It acts as a guiding document to improve, protect, and enhance the many natural, cultural, social and economic resources within the watershed. The CAP serves to organize cooperative efforts between regional, federal, and local partners. It was used to leverage funding to design and support projects, including almost $3 million from the American Restoration and Recovery Act (ARRA) and EPA. Revegetation of upper badlands: The initial planting effort covered 14 acres of bare soil with 2000+ saplings, and 5000+ ft. of Vetiver grass. Planting events remain ongoing. Road paving and draining: 0.4 miles of the upper half of Laolao Bay Drive were paved in 2012 to reduce sedimentation. Concrete sediment basins collect over 3 cubic yards of sediment each year. Culverts and hardened stream crossings reduce erosion in stream beds. Permeable Parking Lot: Exposed, highly erodible soil was replaced by permeable paving stones with grass that helps retain soil and filter runoff. Social Marketing Campaign: The OurLaolao and Laolao Bay Pride Campaign were both conducted to educate visitors about cleaning up trash and to encourage landowners to protect their soils and the reef. Signs and recycling bins were installed at key locations. Sea Turtle Conservation: Critical sea turtle habitat is evaluated, and education is increased through signage and enforcement. No driving on the beach! DPW Cross Island Roadway Reconstruction Project: This on-going, multi-million dollar paving project crosses through the upper watershed, replacing old and unpaved areas with improved drainage and erosion control measures. Water quality and coral reef health are regularly monitored in Laolao Bay. Data are used to track water quality, coral health, and to evaluate the effectiveness of restoration efforts. 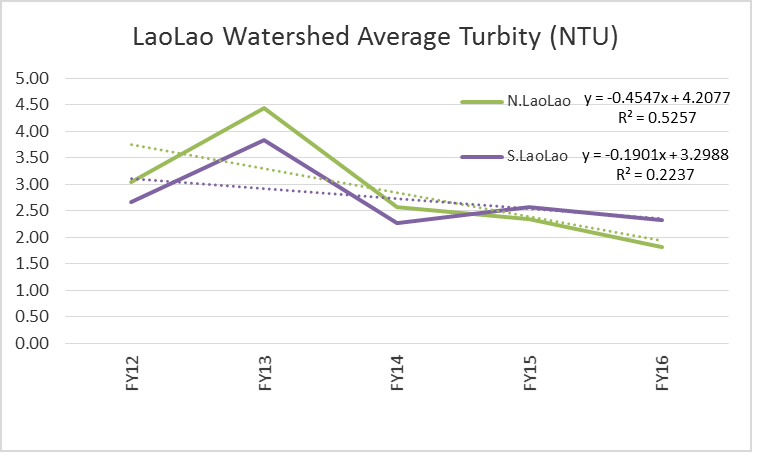 EPA/BECQ recently featured a success story about improvements in water quality in Laolao Bay, which can be found here. The BECQ Water Quality Surveillance/Nonpoint Source branch monitors two beach sites and six reef flat sites for Enterococci, salinity, pH, temperature, dissolved oxygen and turbidity. Water quality is monitored every 8 weeks at beach sites and monthly at the reef flat sites. 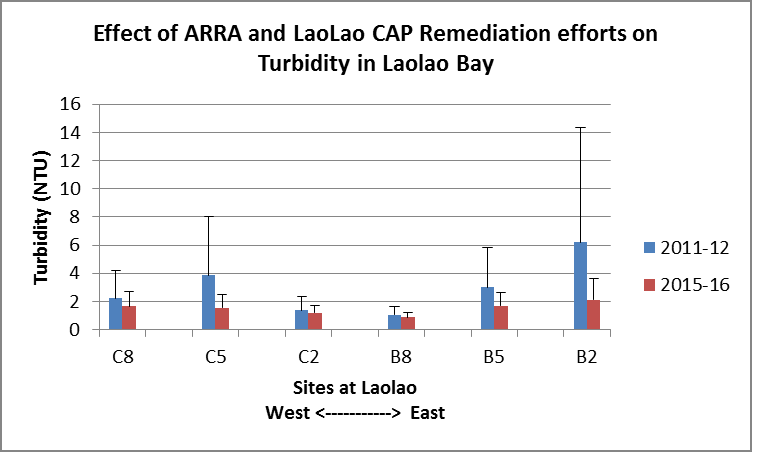 Since the ARRA funded restoration projects in the upper watershed, monitoring shows a reduction in sedimentation (as measured by turbidity). Improvements are seen at all six reef flat sites and at both beach sites. The BECQ Marine Monitoring Team collects data on parameters that indicate coral reef health: The ratio of reef-accreting benthos (coral, coralline algae) to non-accreting benthos (turf and macroalgae); Algal abundance; Food fish counts. (Link to Marine Monitoring Sites).